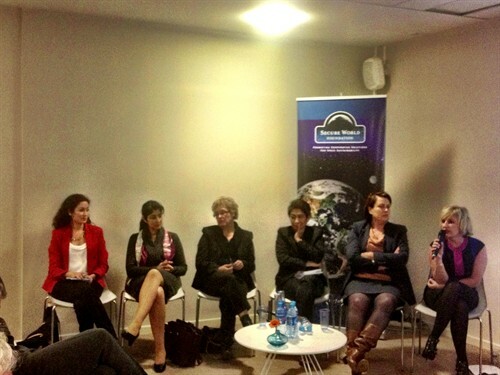 On May 21st the Secure World Foundation and Women in Aerospace Europe held a space policy round table entitled Cooperation vs. Competition in Space Activities, at the Secure World Foundation European headquarters in Brussels, Belgium. This event is interesting not only for the subject but also for the high profile panel, all women, in a field that is traditionally dominated by men. “The partnership on this event is a natural activity respecting our WIA-E and SWF relevant institutional duties on a hot political topic in the space arena,” says WIA-E President Simonetta Di Pippo. The last decade has been marked by an economic crisis, making the need for cooperation in the costly arena of space endeavors become more and more evident. Di Pippo is one of the respected personalities that composed the panel. She joined the Italian National Space Plan in 1986 (later ASI), became Italian delegate at European Space Agency (ESA) for the International Space Station (ISS) program, President of the Human Spaceflight, Microgravity and Exploration Committee at ESA and Human Spaceflight Director at ESA from 2008 to 2011. She’s presently Head, European Space Policy Observatory – Italian space agency in Brussels. Di Pippo explains that humankind has to manage diversity in international cooperation through autonomy; as applied to space, this means each space faring nation must keep its own goals and respect its own requirements in terms of research & development, national pride, political situation, and financial availability, even – or especially – in the midst of cross-border collaboration. Di Pippo is a proponent of a system she calls “autonomy for cooperation,” calling for “a strong worldwide cooperation scheme and at the same time, guarantees the autonomy of each and every country involved.” This is especially true, she says, when it comes to human exploration of the Solar System, an undertaking that need not be nationalistic in nature. Experienced members of the international community joined Di Pippo for this panel like Mazhlan Othman, who is not only a lecturer at University Kebangsaan Malaysia, Director of the United Nations Office for Outer Space Affairs in Vienna, and president of the Malaysian National Space Agency, but also an artistic mind with a keen interest in fusing the sciences with the arts and initiator of the Science Inspired Arts Camp series conducted jointly with the National Art Gallery that brings together, every two years, prominent artists and scientists. Di Pippo and Othman were joined by Theresa Hitchens, Director, United Nations Institute for Disarmament Research (UNIDIR) and Aarti Holla, Secretary General, European Satellite’s Operators Association (ESOA), a well known association born in 2002 to represent the interests of the Earth Observation industry with key European organizations. Emergent professionals like Andrea Jaime, were also represented on the panel. Jaime worked at the European Space Agency as a Young Graduate Trainee for the Human Spaceflight and Operations Directorate and moved to Vienna in 2011 to work as the Deputy Executive Director of SGAC, becoming the Executive Director in July 2012. The panel was purposely chosen from among women leaders of aerospace, in order to equally represent young and experienced professionals, working in different field of the aerospace industry and institutions, to share their experience as women and professional regarding the future of space activities. “We should evolve towards a society in which the gender of a speaker no longer makes a difference,” avers Di Pippo. “The graduated population in Europe is roughly 50% of male and 50% of female gender. Only, as an average, 15% of the workforce in the aerospace sector is composed of women,” she says. Secure World Foundation is a think tank based in Washington DC and Brussels that believes in creating sustainable use of space by exposing the limitation of existing global legal, policy, technical, and operational regimes to preserve the space environment. Woman in Aerospace and SWF share this aim with the difference that WIA specifically encourages the expansion of women’s presence and leadership in the aerospace sector. SWF organizes round tables in Brussels each year and is also one out of 10 corporate members of Women in Aerospace Europe. The panel addressed important themes, called for reflection, not only regarding economic and technological development but also a completely different approach to aerospace and its relationship with diversity and the ‘other’ gender. The panel specifically addressed the fact that the number of space faring nations and actors in space activities is increasing and space activities are no longer exclusive to the big players. Women in Aerospace Europe together with the Secure World Foundation examined the present Actors – States and the private sector, and their relationship to one another and their national strategies as well as policies that will affect international status, security and changing socio-economic balances.